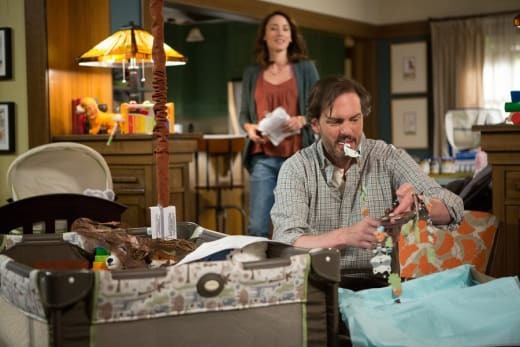 Even as Nick bonded with Adalind and baby Kelly, there were ominous new signs of the coming war in Grimm Season 5 Episode 2. 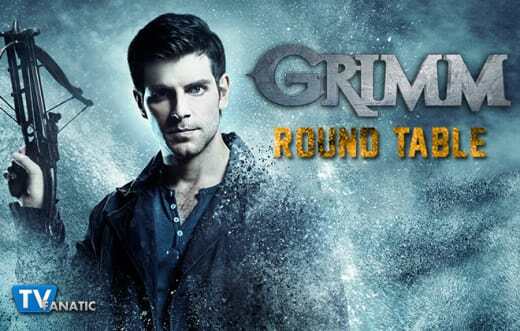 Join TV Fanatic Round Table Panelists Doug Wolfe, Allison Nichols, Robin Harry, and Kathleen Wiedel as they discuss the fallout from the latest episode of Grimm as conflict draws ever closer to Team Grimm in Portland! Be sure to add your own thoughts and join in the discussion in the comments section below! Battle lines are being drawn for the foreshadowed war. Any new thoughts on what's going on? Doug: I’m still pretty confused about it all. And curious. We still don’t know who the nameless group is - or what they’re hoping to achieve. Nor what the beef is. I assume Trubel was abducted because they want a Grimm on their side. Kind of a weird way to gain an ally though. And of course whatever this mysterious “four-slash” enemy is, we know they need a lot of money for what they’re planning. Allison: I'm with Doug. I'm completely confused. This episode showed that this group is organized. They have been building up their war chest, so this isn't just some group of rag tag Wesen who decided to start something. This group means business. Robin: I have no bloody clue. My thoughts don't go far past what we've been shown; I assume there's an uprising of some dangerous Wesen who have considered themselves oppressed or marginalized in some way, and that Meisner's folks are trying to fight that. Who knows. Royals, Verrat, Reapers, Resistance... there are so many conspiring and secret groups on Grimm that I've stopped keeping track. Kathleen: I definitely hope that they give us more to work with soon! Meisner's with the Resistance against the Royals, but he is also apparently opposed to whatever uprising is coming. Unfortunately, that doesn't necessarily mean very much because Meisner's always been something of a wild card. Have your thoughts changed on who Meisner is holding captive in the cell? Doug: No. I still have no idea. It could be Juliette or Trubel, or someone else entirely. Allison: I have no idea. I don't like how we are being kept completely in the dark. We know they have Trubel, so why not show us what's going on with her? It would only help to build suspense. Robin: The kind of ferocity we heard coming from the cell makes it hard to tell. I don't think Meisner would have walked out if that was Juliette, so maybe it's Trubel. I like to think it's some unnamed player that we haven't met yet. Monroe fervently suggested that Nick find a new home. Discuss. Doug: I agree wholeheartedly with Monroe. That place has seen more action than Grand Central station at this point. Maybe it’s time for Nick to find new digs, preferably far from any innocent neighbors who might get killed as a result of his enemies going after him. Allison: Nick should 100% move. There have been too many terrible things that have occurred there. Also, all the bad guys seem to know where he lives, so a move could also help Nick out in his Grimm life. Robin: Not only should he move out, he should burn that house to the ground. Nick needs a nice condo on a really high floor, with security cameras and guards and only one entry and exit point. Kathleen: You all make some really good points. Take a leaf out of Captain Renard's book, Nick, and find a more defensible location. Preferably one far away from neighbors who can get murdered so his enemies can have staging grounds. Did you enjoy Hank being temporarily partnered with Detective Pogue? Doug: I hated that part of the show. I mean we’ve just gone through this with Wu. It was unfair of Renard to put Hank into that situation again. Allison: I'm with Doug. It wasn't really entertaining. I like having everyone in the know. I felt bad for Pogue because he was so left out of things, and he knew it. Robin: I only enjoyed it because of everyone else's reactions. It was some much needed comic relief. Renard's eye roll at the "garden tool" murder weapon comment was a thing of beauty, and Wu's snark about Hank trying to explain the unexplainable was pretty funny. Kathleen: It provided me with some amusement, but I think that Doug hit the nail on the head. We did just go through this with Wu, and it really wasn't handled very well. They even referenced how badly they handled it! I don't think they really brought anything new here. Highlight a scene or quote that stood out for you positively or negatively. Doug: Renard is coming off as a bit of a stunderhead, isn’t he? He knew full well those State Troopers were likely going to get their heads bit off, yet he still told Nick not to go after them. I’m not happy that the FBI is on Nick’s case, though it is logical that they are, given Nick’s performance when he went after Chavez. Allison: I loved all the Nick and Adalind scenes. Their weird relationship is being handled really well. Nick making her a sandwich was adorable. I'm starting to love watching them together. I'm not saying I ship them or anything, but I love their weird chemistry. Robin: Did I or did I not call all those portmanteaus for the baby last week?! I really liked Adalind's heart to heart with Rosalee. 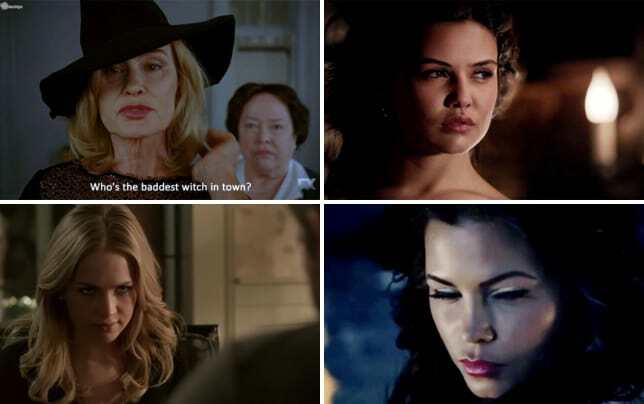 I liked that she doesn't want her witchiness back, and that she knew how horrific she was as a person before. Good job, writers, Adalind has officially won me over. Make sure you're back here for Grimm Season 5 Episode 3! I think we should get out of here before someone tries to paint over *us*. Permalink: I think we should get out of here before someone tries to paint over *us*. Wu: This has *got* to be Wesen! Hank: Can't wait to explain *that* to Pogue. Wu: I'll visit you in the psych ward every Tuesday. Permalink: I'll visit you in the psych ward every Tuesday.